The Urine Off POS Display is small in size, using only 1.5 square feet, but huge in sales potential. The POS Display will stand out in any store and effectively displays any Urine Off products you carry. Place it near the registers or in the aisle and watch the profits pile up. Two great products – three eye-catching displays! Red wine spilled on carpet or upholsteryÖ Coffee drips on a white tablecloth This type of stain has long been considered difficult (if not impossible!) to remove. 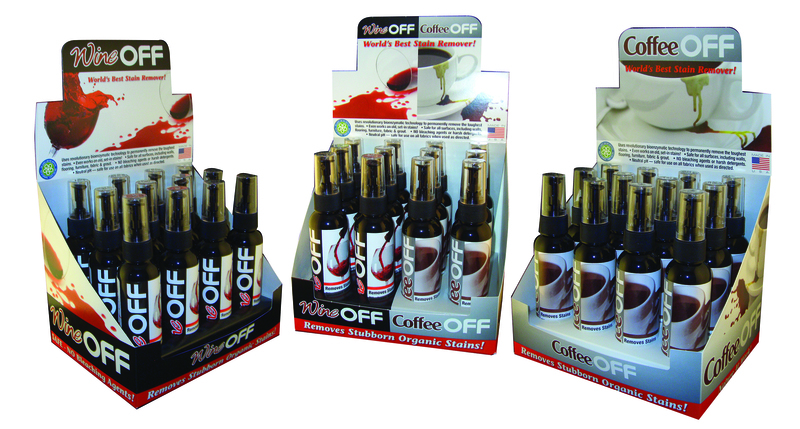 Now, Bio-Pro Research is proud to offer the solution to these cleaning dilemmas: Wine OFF and Coffee OFF! With our specially developed formulas of friendly bacteria and enzymes, Wine OFF and Coffee OFF actually ìeatî the stains, leaving your clothing, table linens and carpeting stain-free. 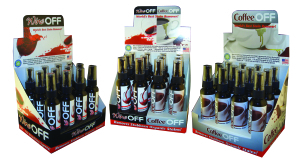 Wine OFF and Coffee OFF are also effective on many food residues and other organic stains. The Display Kit comes with everything you need to demonstrate Urine Off to your customers; you can let the product sell itself! The Display Kit includes a display stand, brochure holder, Potty Mug, synthetic urine, and 20 Urine Off Brochures. The Urine Off Potty Mug is the ideal tool for marketing and selling Urine Off. It provides a clever and fun way to demonstrate the product. Also makes for a great gift. Now your furry friend wonít be the only one drinking from the toilet! 2. Let the customer smell the synthetic urine. Advise the customer not to inhale deeply as the odor is strong. 3. Set the Urine Off Odor and Stain Remover bottle sprayer on spray not stream. Immediately spray Urine Off 3-4 times into the potty mug and gently swirl the mug to ensure mixture. 4. Ask the customer to smell the synthetic urine again. The urine odor will be gone! 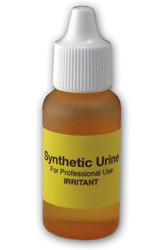 Urine Off Synthetic Urine is an extremely important tool in demonstrating the effectiveness of Urine Off. Let your customers experience Urine Off and its odor eliminating powers first hand by using your own bottle of synthetic urine.